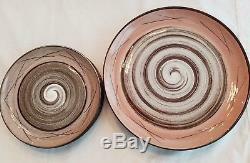 Mid Century Santa Anita Ware "Vreni" Brown Pink White Swirl Dinnerware Service for 4. Willing to break-up set and sell individual items. Some aging, wear and tear. Two of the coffee/tea cups each have a small chip. I don't think the dishes were used very much. Overall they are in really good shape. Some rough white spots on the bottom of some of the dishes (see photo). There is some variation in the colors and swirls but I believe that is part of the overall design of the pottery - no two pieces are meant to be exactly alike. 4 dinner plates - 10 1/4 diameter. 4 salad plates - 7 1/2 diameter. 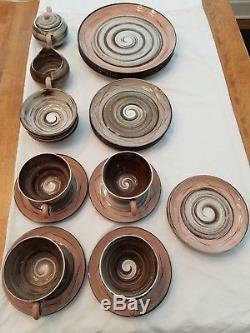 8 bread plates or can be used as saucers for coffee/tea cups - 6 diameter. 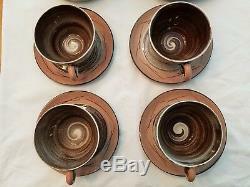 4 coffee/tea cups - 2" (H) x 4" (W). 1 creamer - 2 3/4 (H) x 5 (W). 1 sugar - 4" (H) x 6" (W). 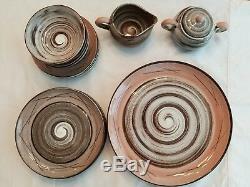 4 small bowls - 1 1/2" (H) x 4 1/2" (W). Comes from a pet-free, smoke-free home. Be sure to check my store for vintage items of all types! 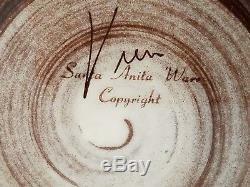 The item "Vintage Santa Anita Ware Vreni Brown Pink White Swirl Dinnerware Service for 4" is in sale since Friday, June 29, 2018. This item is in the category "Pottery & Glass\Pottery & China\China & Dinnerware\California Pottery". 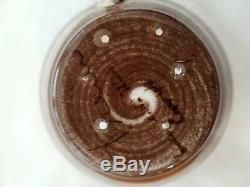 The seller is "deeppocketoptions" and is located in Kansas City, Missouri. This item can be shipped to United States.